We played various boardgames with different people over the festive period, and I’m only going to report on the new games received a presents. Val and Chris kindly bought Azul for us. This game has been attracting a lot of favourable comments amongst gamers recently, so I was keen to try it on the table. Essentially this is an abstract style game, the theme of making a tile mosaic is OK but not strong. The tile pieces are very nice, tactile and work well. The tile selection mechanism is also clean, quick and effective. As the rounds progress, the choices become ever more tough and restricted; you are not simply focussed on your own tile mosaic but also on your opponents. You can see bad tiles mounting up until a player is forced to take them (in one of our games Elaine got the maximum -14 point score for these excess ‘broken’ tiles). So far we have only played the 2 player version, which is very enjoyable and I can see the game will scale up nicely to 3 or 4 players. Play is fast (30-40 min.) and scoring easy. Neither Elaine or I have achieved the +10 point bonus for a full set of 5 tiles, and I think this will remain a rare occurrence. 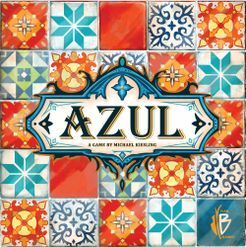 My only criticism of Azul is the point scoring tracks; moving the small cube on a number track is OK but it is so, so easy to inadvertently knock the cube, and you cannot go back and reassess the scores. One of our games had to be abandoned in the final round because of such an accident; very annoying! Also, we have only played the ‘basic’ game and have not tried the free-form ‘gray’ grid yet. I am looking forward to playing this with Val and Chris when they visit in January. 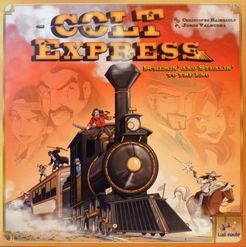 Next, I bought Elaine a copy of Colt Express because it was such a bargain in a local charity shop! Only £3-50 and the game was still unpunched and cellophane wrapped! I spent a happy Boxing Day morning assembling the loco and carriages, and all was ready to go. Now I have played this game before but the opportunity to play a 5 player game arose when my sister, Gill, together with Paul and Erin visited. This is game that benefits from a higher player count, and is most enjoyable if the players do not take it too seriously. I was surprised how quickly everyone picked up the ‘programming’ action sequence and the only problem was remembering what you planned and trying to keep track of other player moves. The flow of the game produced lots of laughs and clever movement of the Marshal meeple caused havoc. Paul proved to be the most clear-headed and easily won the first game. In the second game there was a three-way tie between Paul, Erin and Elaine with $1,950 each (I suspect this does not happen often). Anyway, I’m very glad to have bought Colt Express. I don’t think it will be a regular on the table, but when we have non-gamers visiting who would enjoy a light hearted evening, then this is a game to turn to. Finally, my sister gave me a copy of Metro. 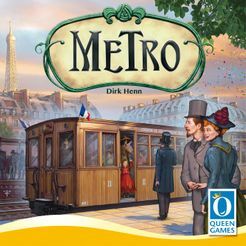 Elaine and I lasted played this at Games Expo 2017, and were very impressed, so I am most grateful to own a copy. I spent this afternoon punching out the counters and organising them in zip-bags (I’m a true Geek) and I hope to play this in the next few days. I would like to wish all my readers a very Happy New Year. I hope you all got the prezzies you asked Father Christmas for, and I hope you continue reading this blog in 2018. Happy New Year Jonathan. I hope the 'Dice Gods' smile on your gaming during 2018.